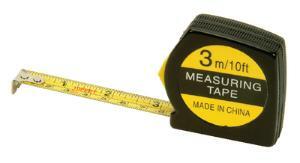 Bright yellow steel tape is marked in both English and metric. Protected by a high impact plastic case and includes a belt clip, loop handle and automatic rewind. Length: 10'/3 m.